This annual tradition was held on Sunday, March 17. As usual, the drinking contest is a battle for speed, not volume. This year, we were fortunate to have a visiting US Senator, Dan Kushuba, to swear in the beer can suppliers and openers, the line judges, and the Grand Marshall. As always, the Grand Marshall is empowered by his Big Stick with the authority to enforce all rules and determine the final winners. The competition in 2019 was as fierce as ever, with bragging rights to the winners. After the contest, the bar was open and DJ Nick kept the festivities going with singing and dancing to celebrate one of our favorite events of the year. Special thanks to all of our officials and to everyone who participated in the contest! This year, we decided to start a new Big-O tradition that allows the spouses of previous Big-O couples to celebrate their anniversary with us even if they have lost their spouse. Going forward, we will honor them as Big-O Alumni. Our Big-O Alumni contributed to our event this year in several ways. Bob Murphy, who is 97 years old, read the names of all 21 couples that have been married for more than 50 years. Hilde Champion worked on the floor with the Big-O couples when they needed a microphone. Carol Pringle, our third Big-O Alumni, greeted everyone at the door, made sure they had a program, and directed the “Over-50” couples to their reserved seating. 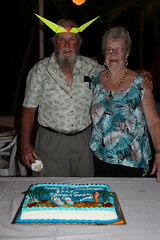 Our winners for longest marriage went to Shirly and Marv Bohnen for celebrating 64 years of marriage. In addition to special seating, and one of our exclusive buttons, of course. 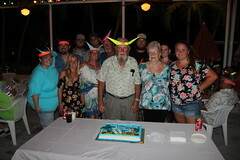 As a special honor, the couple that had been married the longest – Shirley & Marvin Bohnen – received free drinks, all night long. Judy Reibline played her usual role as our professional Master of Ceremony. 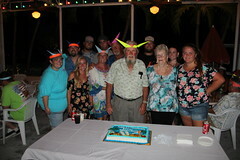 During the event, our six 2019 Big-O couples shared a real-life first experience of their choice and to share their first night at the Big Pine Key Fishing Lodge. Bonnie and her choir of couples that had been married over 50 years gave each couple a round of vocal applause by singing a few bars of “Fools Rush In”… but I’m still in love with you! From there, our Big-O couples received their special anniversary cards, handmade by our own Vicki Gladwell, and we opened up the dance floor for music and dancing. The Bait Shop Bar was open and serving up Joan’s signature, complimentary Sunset Rum drink. As usual, a great time was had by all, and we are already looking forward to next year’s Big-O celebration! Shirley & Marvin Bohnen – Stillwater, MN – married 64 years! Joni Cottrell, from Muskegon, MI, has been a guest at the BPKFL for more years that we can remember. She inspired the original water aerobics class and ran on Mayor Wyatt Watson’s ticket as his Vice Mayor. 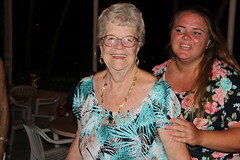 Her annual celebration of the shortest day of the year – held in December – is a camp-wide social evening enjoyed at her waterfront site that sits adjacent to Sun Beach. This is a wonderful activity that is beloved by everyone. Over and above all of these things, has been the role she has played as unofficial – but very important – camp photographer. Years ago, Joni took it upon herself to photograph every Winter event no matter how large or how small. Then, she would take the extra step to place those pictures in albums that you may have seen, or heard about. These albums are an important part of life at BPKFL, and – – without exception – – the first thing I was asked about after the hurricane was… Did you save the albums? Yes, the albums were all saved… every single one. Joni is retiring this year from visiting the BPKFL. We asked her if she would like to see her albums so she could know that they were being kept safe until they could be returned to their home at the BPKFL for everyone to enjoy. The albums – which start in 1972 – weigh in at a whopping 208 pounds. Slightly more than half of them were completed by Joni over the course of 15 years – – and here is the picture to prove it. We will always have a warm place in our hearts for Joni and wish her the very best in her future endeavours. She will always be a part of our family and she will be missed. 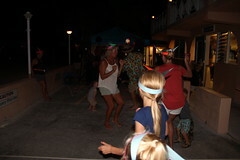 This year’s skit celebrated Key West and why we take all of our out-of-town guests there when they come to visit. The cast was superb and a great time was had by all. As usual, Brian opened the evening’s festivities by announcing the 2019 camp sweetheart. Pat Strauss is absolutely loved by everyone in camp and there was a great round of applause when she was selected to come on stage and accept her gorgeous, framed photo featuring two of our key deer showing their affection. We are so glad to have Pat as a part of our BPKFL family and can’t think of a better camp sweetheart for 2019! 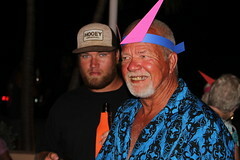 Hans Hoffman acted as our MC this year, as well as – literally – wearing another hat as our conch train tour driver. 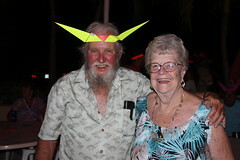 After the conch train tour, Hans changed his hat again to MC our visit to all the sunset activities that take place each night out near the docks in Key West. The cast consisted of many “extras” that represented the excited tourists that ride on the conch train and visit the docks at sunset. It can’t get any better than Stan Felton walking the high tight rope, unless you get a chance to see the Cat Lady of Key West, Terry Clauss, with her fantastic cat Lil. One of the night’s highlights was our Escape Artist, Gene Doyan, who was wrapped in chains and rope and somehow managed to free himself in a flash – – with all our extras as witnesses. The festivities were capped off with an appearance by Bob Gagon, the Human Statue. Bob can stand all night and never make a move or bat an eye! Barb Zappulla suggested that everyone NOT dance the night away at Sloppy Joe’s but return home to the BPKFL instead. The evening was wrapped up with a truly original, warm, fuzzy closure by Judy Reibline. Special thanks to all our actors and everyone that helped to get this fun show on the stage! Let it be known that 2019 marked the very best Second Hand Rose luncheon ever! Hosted – yet again – by Shirley Leppa and Mary Sentineal. In the past, we hosting a clothing swap at camp where guests could trade and give-away clothing items. This year, Shirley and Mary changed up the format and asked attendees to donate their clothing items and money to the Domestic Abuse Center in Marathon. A special program at the center meant that every dollar donated was DOUBLED. So, in addition to the clothing, the money donated by the BPKFL was $700! How about that?!? This luncheon is just for the girls and we ask everyone to bring a dish to share. In total, we had 54 ladies in attendance. The event includes a dress contest, and buttons are the usual coveted awards given to the winners. Shirley did not open the event by singing “Second Hand Rose,” as she normally does. They decided to shake it up by inviting a special guest for the ladies: Dean Martin (Mike Conley) entertained everyone with his rendition of “Everybody Loves Somebody, Sometime.” All 54 ladies in attendance were swooning! The camp guys said that Mike has become known for his Dean Martine act, but they say he’s really not too fond of doing it. However, give him the chance to be the only man in a room with 54 swooning women, and he will sing! Atta boy Mike, we love you! That said, even with Dean Martin in attendance, I felt a little cheated not to hear Shirley belt out her acapella version of Second Hand Rose. But guess what? She closed the event by singing her signature song to a cheering crowd. It was fun girls, let’s do it again next year! 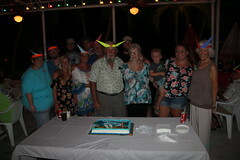 For those of you that are new to the BPKFL’s traditions, celebrating a Big-O birthday is a very special affair. A “Big O” birthday is one that ends in a zero: 10, 20, 30… and right on up through the decades. If you have had, or will have, such a birthday this year, then you are considered a “Big O” honoree – which gives you access to special seating and an honoured role in the evening’s festivities. and….. the Big Pine Key Fishing Lodge, which turned 60 this year! Represented in this group are people turning 30, 50, 60, 70…. and four octagenarians turning 80 in 2019! Talk about a reason to celebrate in one of the most beautiful places on earth! The skit itself was opened by Mike Laycock, one of our Big-O birthday honorees that have celebrated all 28 Big-O birthday celebrations since they began back in 1991. Mike introduced everyone to The Log – – the BPKFL’s annual newsletter that started back in the 1970’s. The Log began as a way to keep everyone updated on day-to-day life in camp written and distributed by the guests, into the online forum that exists today. 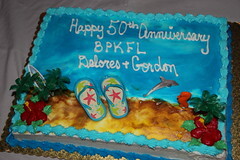 To celebrate the long history of the BPKFL – which turned 60 this year – in seemed like the perfect time to look back at the old Logs and see where we have been and how far we have come. 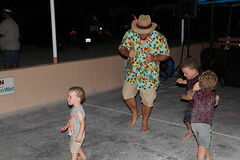 After the skit, we cleared the floor to make way for a dance floor and a DJ, so everyone could dance the night away. Special thanks to everyone who came out to celebrate this year’s Big-O birthday honorees with us – it was truly a wonderful evening. The Big Pine Key Fishing Lodge exists on an island of hard rock, however, through the years it has formed a huge soft spot. This soft spot grows every year with the feelings of joy and sorry that we share together. Because of this bond, it is impossible not to feel and share your grief. Al Treu grew up with his family on their winter vacations in rustic camping. Al was only in his late fifties. He was fun and loveable. He rode the only Harley that was ever ridden through the rec room with his wife Jean, the New Year’s baby. Those that knew Al will always have over and beyond memories to recall and share.